Given the full LED headlamps, the massive hexagonal grille and those taut shoulder lines, you might think you are looking at Audi’s new A4 here, when in fact this is the noticeably more affordable A3 which has been comprehensively updated for 2017. Armed with Audi’s latest design language, improved feature list and a new petrol motor, the 2017 A3 makes for an attractive proposition. Here’s what has changed and how. For starters, it looks a lot similar to the A4 now thanks to the redesigned LED DRLs. The car that we got, featured all LED headlamps as well, though it is not a part of the standard kit. It now sports the hexagonal ‘Diamond-inspired’ single frame grille as a part of the family design. The front bumper has been redesigned and features slimmer air vents that lend a sporty appeal to the styling. The shoulder line is more prominent and at the rear, the tail lamps retain their shape but the detailing is now different and also boast dynamic turn indicators, like the ones on the new A4. The rear bumper has been given an overhaul as well and now looks a bit more aggressive and sporty. Panoramic sunroof though is standard across the range. It also now runs on new 16-inch alloys shod with Bridgestone or Michelin rubber. The Audi A3’s interior isn’t very different from other Audis, but there are a few things that will make you sit up and take notice. The first thing is the MMI screen – it pops up out of a slot at the top of the centre console, which is very impressive. Paired to this is the rotary knob on the centre console which has a touchpad on the top. This is much like a laptop computer’s mousepad, and you can write on it with a finger and it will recognise the letters, no matter how bad the handwriting. (We tried it, it works.) The second is the new design of the air vents. Audi says they’re modelled on a jet fighter’s turbines. Claims of turbofan resemblance aside, they are very pretty things, and the bezels have to be rotated to cut airflow. The crowning glory is the central circle – pull to focus airflow, and push for a diffused effect. This should help in cooling all of you equally rather than just one ear or your fingers. All the usual bells and whistles are present – leather upholstery with contrasting stitching, a very nice four-spoke steering wheel, a multi-function display, a CD player with different multimedia options and a 20 GB hard drive, and dual zone climate control. The AC is effective and has a rear blower as well. Sat nav is an optional extra for some variants but is standard for the top-spec variant. The seats are comfortable, of course, but tall people should stick to the front. The rear is surprisingly roomy for the car’s size (and roofline), with just enough headroom and knee room for a six-footer. Three abreast is going to be a big ask, though. Two at the rear will be comfortable, what with the armrest and dual cupholders and even a 12V socket exclusively for the rear seat. The A3 gets access via the central armrest recess at the rear to the 425 litre boot, which is a lot larger than that figure suggests. If it isn’t large enough for you, the rear seats split and fold flat for greater convenience. The 2017 Audi A3 comes with a choice of two power-plants – a 1.4-litre TFSI turbo petrol and the familiar 2-litre TDI diesel. Whereas the former is paired to a 7-speed dual-clutch gearbox, the more efficient diesel works in conjunction with a 6-speeder – also a dual clutch unit. Starting with the petrol variant, Audi has replaced the old 1.8-litre TFSI unit in favour of this 1.4-litre motor which makes 150bhp and 250Nm of torque between 1,500 and 3,000rpm. Unlike its competition, the petrol powered A3 comes with cylinder-on-demand tech, which shuts down two of the four cylinders when you’re just pottering around. Then, as you floor it, all four cylinders fire up for maximum thrust. Within city limits, the motor is surprisingly brisk, pulling strongly from around 2,000rpm. But despite making as much torque as the 1.8-litre unit, the new A3 doesn’t pull as hard as the older car. Where the 1.8-litre motor pushed you back in your seat, the 1.4-litre motor feels more linear and laidback in the way it goes about its business. As for refinement, the new A3 offers impressively low NVH, with a near silent idle and staying composed till about 4000rpm. Its only near the redline that the motor gets a bit loud. The 7-speed gearbox is undoubtedly quicker to respond than the competition and teamed with this engine’s eager power delivery, the surge of acceleration is addictive. The only downside to the gearbox is the jerky low speed behaviour and delay in response as you floor the throttle. The 2-litre diesel continues to offer strong mid-range punch. It may be a little noisy when worked hard but it never feels vibey or harsh. Like in the older car, there is more than sufficient pulling power, all of which is efficiently transferred to the road via a 6-speed dual clutch automatic. Like its petrol-powered counterpart, gearshifts are rapid and smooth on the go but the overall response is a little jerky at crawling speeds. What we have here is, quite simply, one of the sweetest-handling Audi sedans we’ve come across in years. We’ve always found the handling of the bigger As to be really competent, but this one adds another element – fun. It’s simply a joy to chuck around corners, and that’s down to a number of factors. Primarily, it’s the very stiff chassis, which has allowed Audi to give the A3 softer suspension without corrupting the dynamics. Then there’s the steering, which though still not perfect, feels miles more direct and full of feel than just about any other recent Audi. The end result is a car that will eagerly dart into corners as quickly as you dare throw it. It feels light on its feet, there’s not too much understeer, with loads of grip, despite the lack of Quattro, and the body roll is all but imperceptible. As for the ride, in the diesel, with its stiffer front end, you will feel a bit more of what’s going on under the tyres, particularly at city speeds over, for instance, a poorly paved piece of tarmac. Even so, it’s not as firm as the Mercedes A-class, and Audi’s equivalent of a ‘rough road package’ for India (read: added stiffness) seems to have been calibrated perfectly for our conditions. The petrol model is even better, with a slightly softer edge, especially when you consider our test cars were top-spec, wearing 17-inch wheels on 45-profile tyres. It’s impressive that Audi has managed to achieve this sort of compliance without the adaptive suspension trickery that you find in the bigger cars. The only fly in the ointment is road noise, and a fair bit of it comes into the cabin as you pick up speed. All said and done, Audi has nailed the ride and handling package on the A3, and for once it’s something we hope filters upwards into the next A4. The Audi A3 received 5-stars in the Euro NCAP crash test. There are abundant safety features on offer and the car feels very well built. Front and side airbags are standard across the range and the higher end models also get rear airbags and knee airbag for the driver. Besides the standard ABS, the A3 is also equipped with ‘Electronic Stability Control’ (ESC) and ‘Electronic Limited Slip Differential’ as standard. Audi A3 Ex Showroom Price in India ranges from 35,53,180/- (A3 35 TFSI Technology) to 37,12,760/- (A3 35 TDI Technology) .Audi A3 has 4 Variants of Petrol are available in India. Audi A3 comes in 6 colours, namely Beluga Brown Metallic,Brilliant Black,Misano Red Pearl Effect,Scuba Blue Metallic,Florett Silver Metallic,Glacier White Metallic. 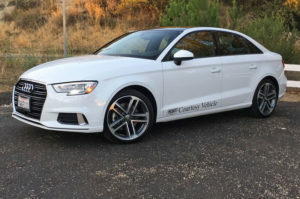 Audi A3 comes with TDI Direct Injection Turbo Charged Diesel Engine with 1968 CC Displacement and 4 Cylinders with Maximum Power 143 bhp@3500-4000 rpm and Peak Torque 320 Nm@1750-3000 rpm DRIVE TRAIN FWD and reaches 100 KMPH at 8.6 seconds . Audi A3 comes with Automatic Transmission with FWD . flying off their shelves.